So far this year, Dunkin’ not only brought back its value breakfast menu, but the donut and coffee chain was also met with a little competition from McDonald’s, which released its own version of Dunkin’s popular donut fries. But the latter isn’t phasing Dunkin’ one bit, as it just announced the release of not one, but three new lattes and a new brew via its collaboration with Harpoon Brewery. Because it’s not even noon and we’re still working on our caffeine intake, let’s talk about those new lattes first. 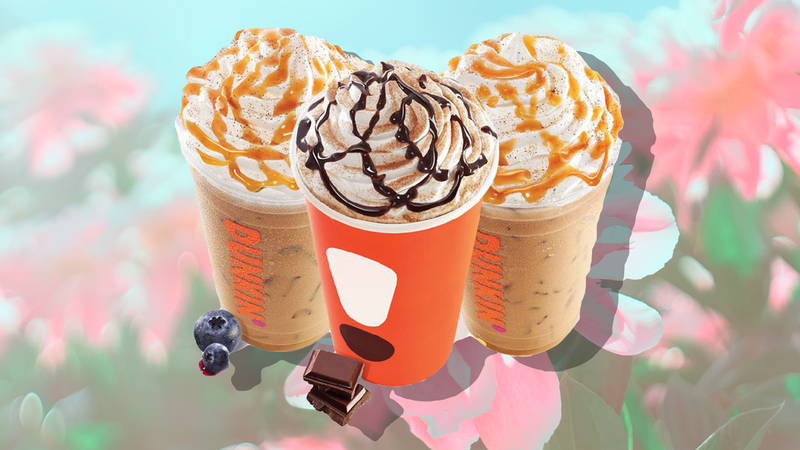 Added to its signature lattes menu nationwide are the Blueberry Crisp latte, the Caramel Craze latte and the Cocoa Mocha latte — and we can’t decide which one we want to try first. The Blueberry Crisp latte isn’t just a blueberry bomb, though; it also features caramel flavors, a caramel-flavored drizzle, cinnamon sugar topping and whipped cream. Caramel Craze is basically Blueberry Crisp without the blueberry flavor, and Cocoa Mocha doesn’t skimp on the chocolate and mocha. You can even order these lattes iced if that’s more your speed. “With our three new Signature Lattes, guests can now treat themselves to Dunkin’s premium espresso combined with the kinds of fun flavors our fans love from our brand, along with special toppings for a little extra enjoyment,” says Tony Weisman, Dunkin’ chief marketing officer, in a press release. Dunkin’ and Boston-based Harpoon Brewery’s partnership began last October when they released the Harpoon Dunkin’ Coffee Porter. But their latest creation, the limited-edition Harpoon Dunkin’ Summer Coffee Pale Ale, was released today and will be available through the summer. Unfortunately, the pale ale is only available in select locations on the East Coast. This bright, coffee-flavored brew clocks in at 5.9 percent ABV, and according to a press release, pairs well with coffee-rubbed brisket, chipotle chicken tacos and Dunkin’ coffee rolls. According to Harpoon Co-Founder and CEO, Dan Kenary, the timing couldn’t be better.